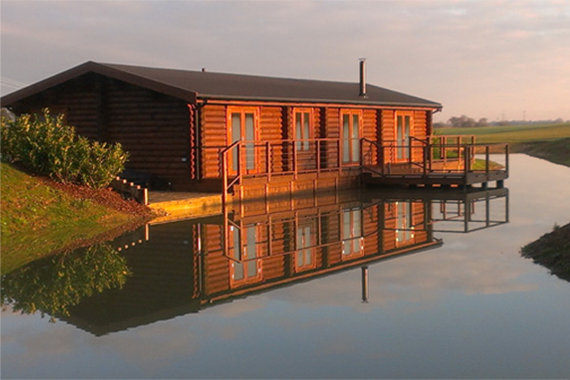 We have four stunning Scandinavian style log cabins each sleeping up to four people in two double bedrooms. There is also the option to rent out a cabin as a one bedroom lodge at a reduced rate, this will automatically be shown when you select the number of people on the booking page. This makes us a perfect romantic retreat for couples and an ideal honeymoon destination. 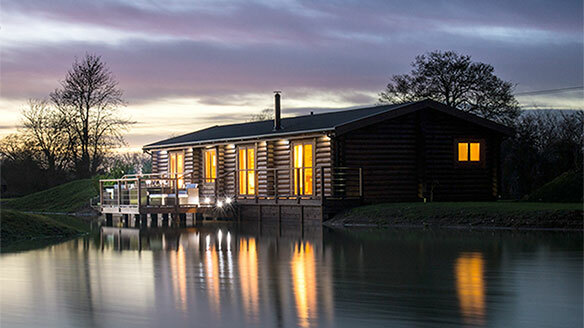 The log cabins are set around a lake which has been designed to maximise privacy. 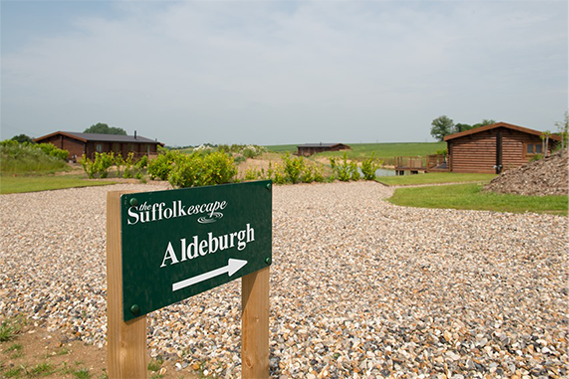 We limited the site to four cabins to keep it exclusive, peaceful and allow everybody space to enjoy the open countryside. The interiors of the cabins are designed around open living in the kitchen, lounge and dining areas. Click on the name of each log cabin for more information. 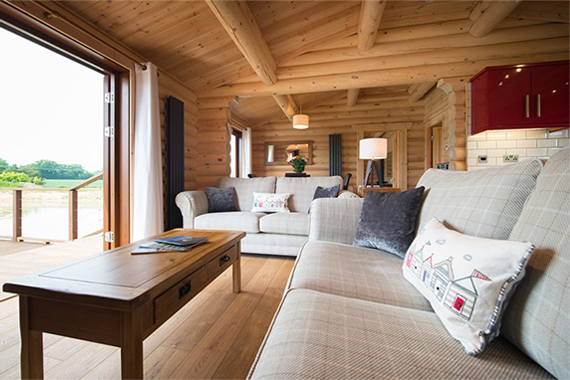 Each log cabin has two large comfy, handmade sofas. The sofas look out onto the decking and the lake. The lounge has a wood burner, with sustainable firewood sourced from our farm, perfect for a cosy winter’s night in. There is a large LED television with sound bar, free-sat and a blu-ray player. There is a separate hifi system with i-Pod docking and free wifi internet service (for surfing only, not downloading music, TV or movies). Should the weather turn against you then you will find a range of books and games in the cabin to entertain you, perfect in front of a roaring fire. The lodges have very large, bespoke designer kitchens fully stocked with all the utensils and equipment you should need. The high quality appliances include double oven, induction hob for fast cooking, microwave, fridge, freezer, dishwasher, washer/drier and all the useful smaller items. The kitchens are designed with a length of worktop which looks out over the lounge and onto the lake. The open plan dining area has a large dining table which can seat up to eight people should two cabins of friends wish to eat together. The dining table has a large window looking out onto the water. The bedrooms are very generous in size featuring an ensuite and double doors out on to the deck at the lake’s edge. We have fitted black out curtains to help ensure a long lazy lie in and also to help keep the sun’s heat out during the hot summer days. The bedroom’s main feature is the huge “Emperor” two metre square beds. These are larger than super king size with an indulgent specially made mattress,complimented with luxury duvets and pillows. You will also find a dressing table and mirror, full length mirror, chest of drawers and built in wardrobe with long hanging, perfect even for a bride’s wedding dress! Each of the bedrooms has its own Freesat LED televisions which enables all three televisions in the cabin to be showing different programmes at the same time, should you so desire. There is a hifi with iPod dock and integrated wall speakers which can also be switched to also play into the bathroom. 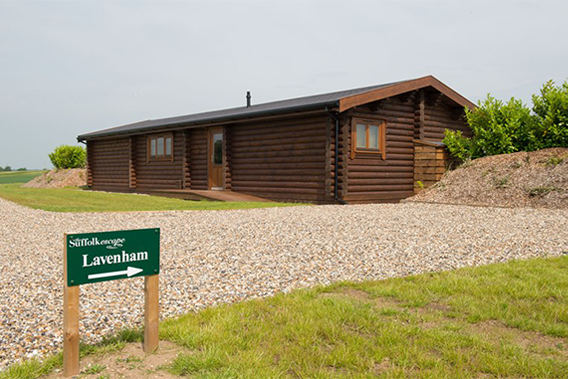 (Cabins Lavenham and Southwold can each have one bedroom that can be set-up as a twin). Each bedroom has a very generous en-suite bathroom with its main feature being a stunning Castello freestanding stone bath, as used in Sir Richard Branson’s ski lodges. These luxury baths are incredibly comfortable and warm to the touch… the perfect place to relax with a glass of wine, listening to some soft music. There is also an oversized walk in shower cubicle and a his and hers sink unit with marble top. The outside space is where our log cabins really come into their own. Each cabin is set right on the water’s edge with a deck running along the front accessed by double doors from the bedrooms and lounge. You can step down from this deck to a lower deck positioned over the lake with comfortable external dining furniture which can seat eight people should guests from two cabins wish to dine together. To one side of the cabin is a patio area with a top of the range hot tub with coloured lighting and most importantly a huge range of jets for the perfect way to recover from the day’s activities. We have designed the site so there is privacy around the hot tub but also views out onto the lake should you choose. In the summer here you will also find outdoor sofas with cushions for relaxing on with a chiminea to take the chill off in cooler evenings (logs can be purchased from the Suffolk Escape). This has to be the perfect setting for an evening cocktail with the water lapping just in front of you. Elsewhere around the cabin there are areas of grass to relax on or head for walks around the meadows surrounding the site.